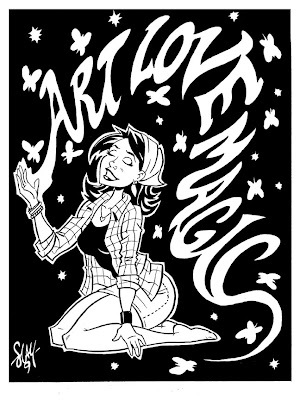 Me and my buddy Michael Lagocki, Ghostwerks member and founder of Art Love Magic are doing a pin-up swap. He's doing a Spookytown piece for me and here's the one I did for him. It's his muse/mascot, named Haley. Reference image here. If you're an artist, musician, poet or are just into all things creative, be sure to look into what he's doing. It's fairly rad.